In the Pension Life office, we have been wondering how to get the information about pension scams more widely seen, heard and taken on board. We’d like to ensure the masses are educated and aware that pension scammers can strike from many angles, and with a variety of “deals”. Pension scammers must be stopped and together we can work towards this. A quick Google search of the phrase “Pension Scam” shows no end of advice available, so why is this information not being spread to the public more widely and effectively? Why was 2017 the WORST year for pension scams? Google’s current top-ranking search return for the phrase “pension scam” is How to avoid a pension scam by Pension Wise. This site offers simple and basic information on how to spot a scam and how to report it. This is followed by The Pensions Regulator (tPR) which, offers 5-step advice to protect a pension from pension scammers. In third place, the Money Advice Service offers information on “How to spot a pension scam”. Money Advice highlight that scammers can be very good at disguising themselves as bona fide, regulated companies. The FCA’s website comes in fourth, with their information on smart scams, advising people to be aware that the offer of a free pension review is often cause for concern and suspicion. But, even with all this information out there, 2017 was still the worst year ever for pension scams. It seems that despite changes to regulations, scammers seem to come out on top nine times out of ten. Serial scammers are able to move onward and upward, scam after scam after scam. Officials, like the regulators, ombudsmen, arbiters and HMRC just stand idly by letting it happen again and again and again. Maybe the problem is that the scammers are ever evolving in their behavior and tactics – and the authorities just can’t keep up. Pension Life came about because of the Ark pension liberation scam. But scamming tactics have moved on considerably. We now we have noticeably less liberation and more investment scams where the introducer heads for the investment with the highest commissions, with no regard for the risk or fees that are applied to the fund. 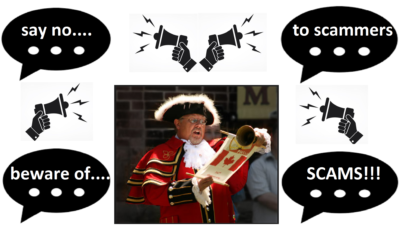 Furthermore, if someone does approach you via a cold call claiming to be a viable company with a convincing sales pitch – how do you know if what they are saying is genuine? How do you know if they are a qualified financial adviser? Unfortunately, in the business of pensions and finance, the sad truth is that you need to: trust slowly; question quickly. In the CWM case, victims saw unqualified, unregulated advisers placing low to medium risk investors’ entire funds into high-risk, fixed-term structured notes. Fractional scamming is also on the up. Unqualified, unregulated firms posing as financial advisers act as “introducers” – and often introduce thousands of victims to outright scams. The funds then go through various other parties’ hands to ensure everyone gets their piece of the pie. Each party involved along the chain, creams their bit off the top of the pension fund, until the fund is a fraction of its former self. This means it will take years to get the pension back to its original state, let alone to start showing a profit. Perhaps one of the most iniquitous aspects of pension and investment scams is the routine use of insurance bonds. (a significant part of the fractional scam and an unnecessary second “wrapper”). The life offices themselves are a big part of the pension scam industry. Firms such as OMI, SEB, RL360 and Generali accept business repeatedly from unlicensed firms and known scammers. These so-called “life offices” (although they really ought to be called “death offices”) sit back and watch while these scammers gamble away the victims’ life savings on toxic structured notes and high-risk investments. 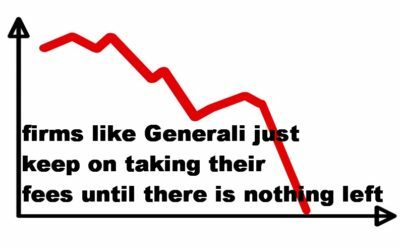 Despite reporting on the inexorable destruction of the funds, firms like Generali et al just keep on taking their fees every quarter – and will sometimes do so until there is nothing left in the fund. The best advice we can give, is to ensure you know exactly who you are dealing with and where your money will be going – every penny of it. There is no such thing as “free”, and there will ALWAYS be commissions and fees on any pension transfer, legitimate or not. But however much it is – as in REALLY IS – the client needs to know and accept these costs. Many advisory firms conceal the real costs and the clients only find out what they are when it is too late, and the damage has been done. Make sure you have everything in writing AND read it all – at least three times, if not more! Make sure you understand everything: the costs, fixed terms, the risk level of investments – and if you don´t, then ask more questions. Keep a regular eye on your fund; don´t trust any company 100%; make sure you know exactly what your fund is doing and do not ever be fobbed off with the explanation that any losses are “just paper losses”. If in doubt – JUST SAY NO!! I am writing a series of blogs about pensions, pension scammers and how to safeguard your pension fund from fraudsters. Please make sure you read as many as possible and ensure you know everything you should about your pension transfer. You only get one shot at getting it right – if you get it wrong, the damage may never be undone. If we can ensure the masses are educated about pension scammers and financial fraud, we can help stop the scammers in their tracks – globally.